Regular readers of the blog will know that the Hungarian brand Bagaboo is quite easily one of my favourites out there. They're a smallish company producing bespoke and beautiful products that last incredibly well. 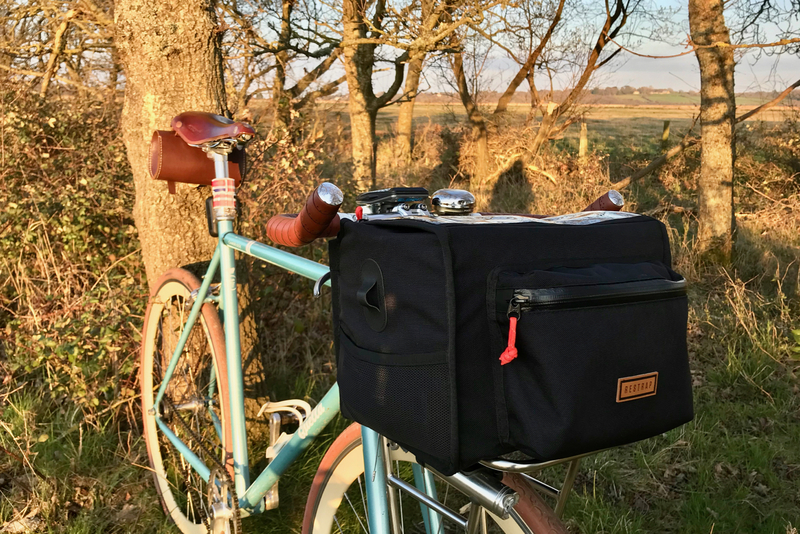 In the past I've reviewed their Workhorse Messenger Bag (Link), which still looks as good as new, despite almost daily use. 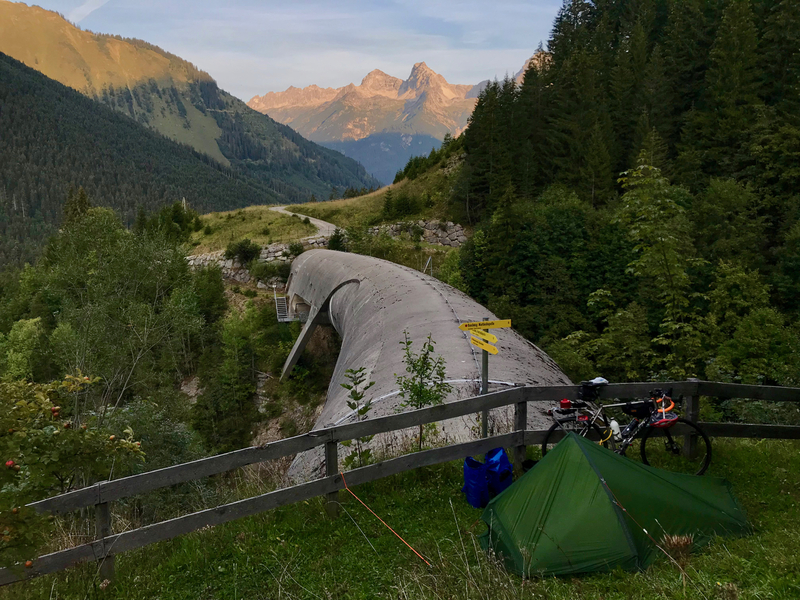 I've also reviewed their Rancid Rucksack (Link), which is a great little day pack that is ideal for longer mountain bike adventures and commuting. 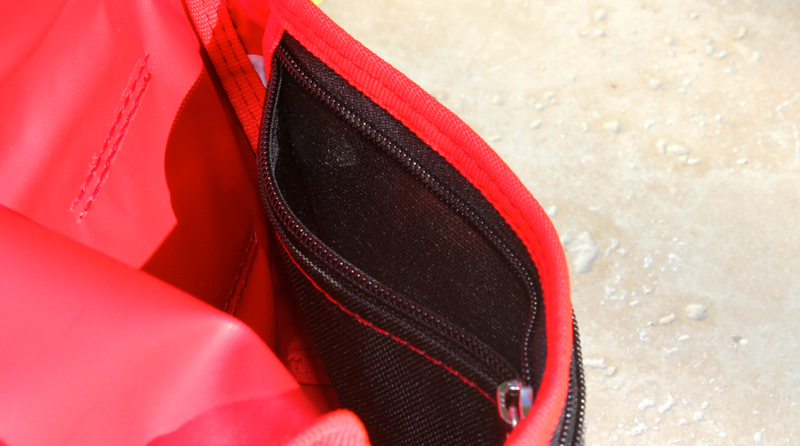 In this review, I move one size further down the line-up with the Bagaboo Hunch Hip Pouch, and the matching Felvarrom inner tube belt. 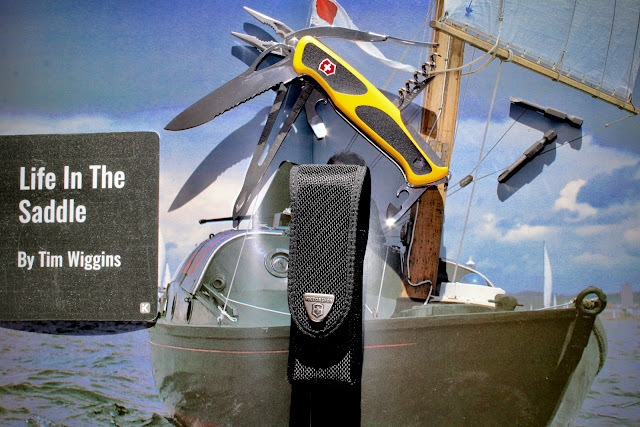 Two very cool products that provide a unique and quirky look. 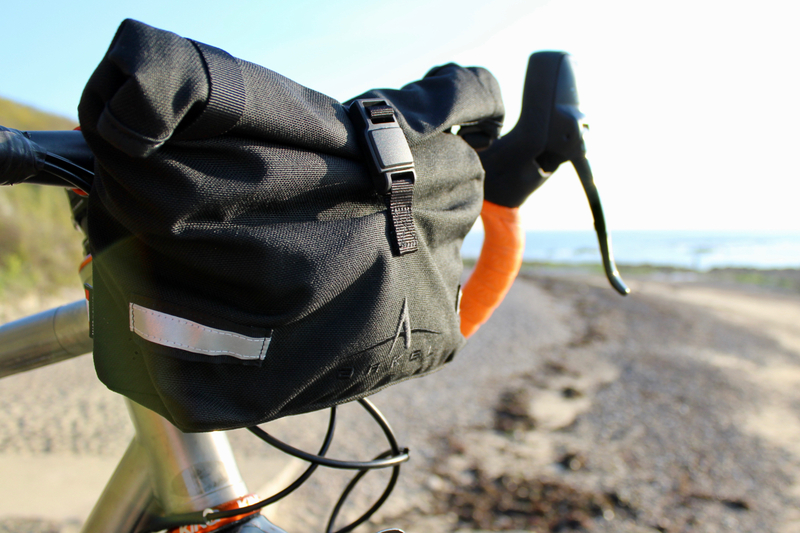 The Hunch Hip Pouch is designed for those around-town errands, lightweight commutes and mini-adventures on the bike. 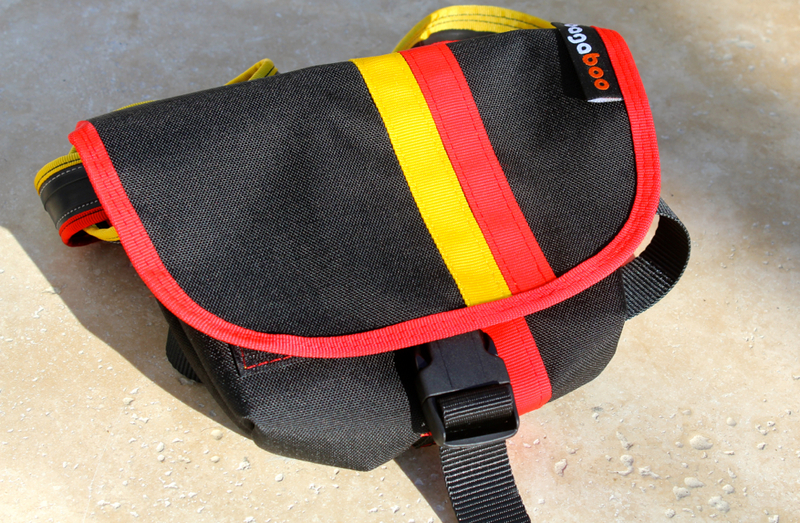 It's a quirky take on the rather scorned "Bumbag", with a distinctly cool appearance and practical design. The pouch is made of Bagaboo's two stable materials; incredibly tough and waterproof Tarpaulin, and super durable and wear resistant Cordura. The combination means that much like the Bagaboo Workhorse Messenger Bag and Rancid Rucksack, this is sure to look like new even after months and months of abuse. 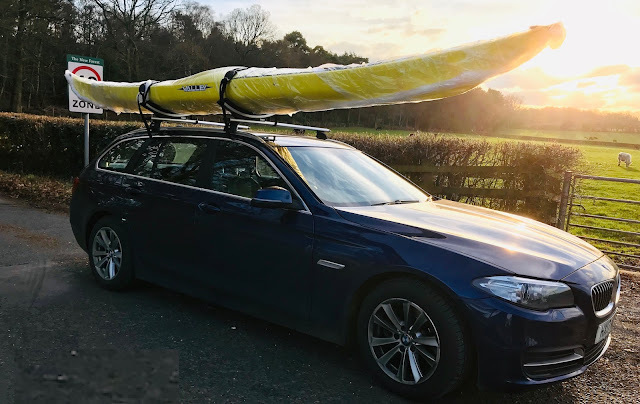 Quite literally built for life on the road. 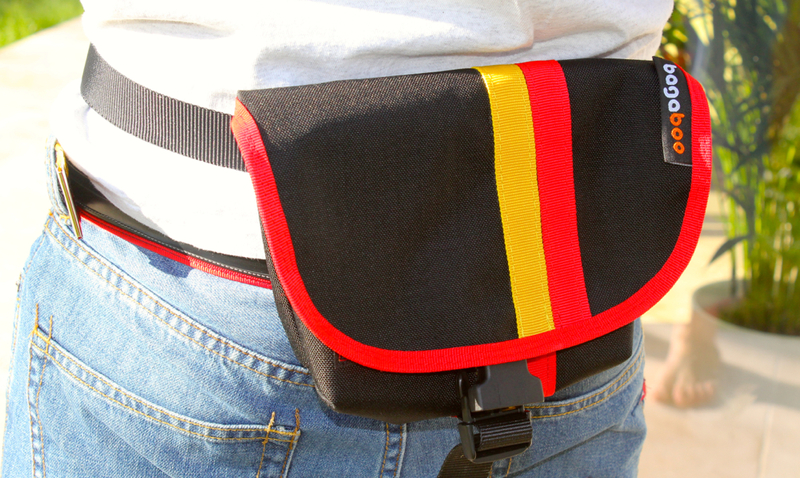 The design of the pouch is super neat; it is a miniature messenger bag! 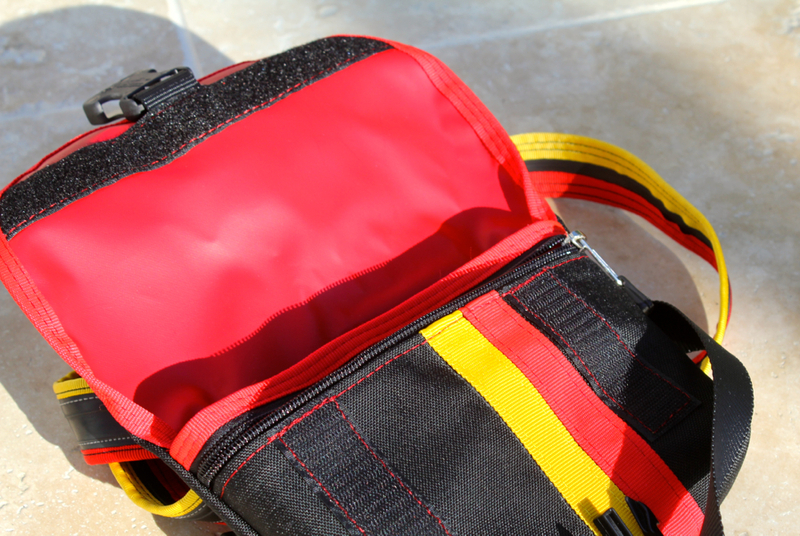 It has the same flap over waterproof lid as a messenger bag, and it has two secure zippered pockets to keep smaller items safely secure. You can fasten the pouch to a belt using two webbing straps on the rear, or there is a supplied webbing belt with a quick release buckle. The pouch is ideal for when you need to carry a few small items, but you don't want to risk them falling out of your pockets. 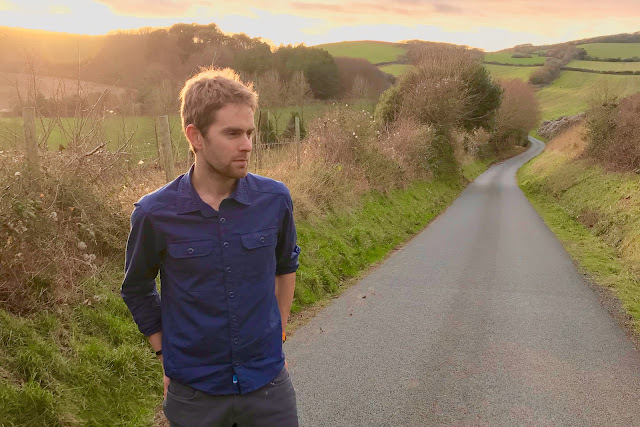 A quick run to the shops for a snack, a trip to the pub for a drink, or a nip across town for a meeting. 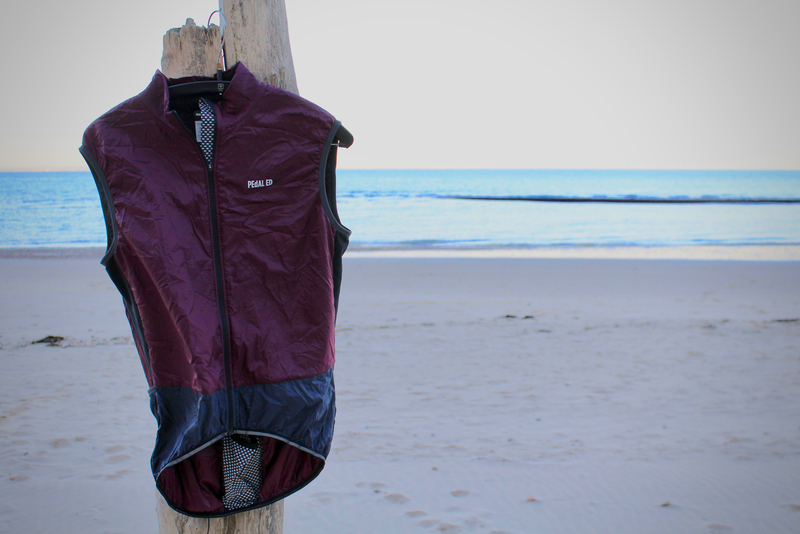 It's an ideal solution to pockets crammed full of kit. This is a very cool little bag, and I've found it useful on a number of occasions. Almost predictably now for a Bagaboo product, it is superbly made. It copes well with being thrown around and when confronted with a sudden downpour; your valuables are left safe, secure and dry. 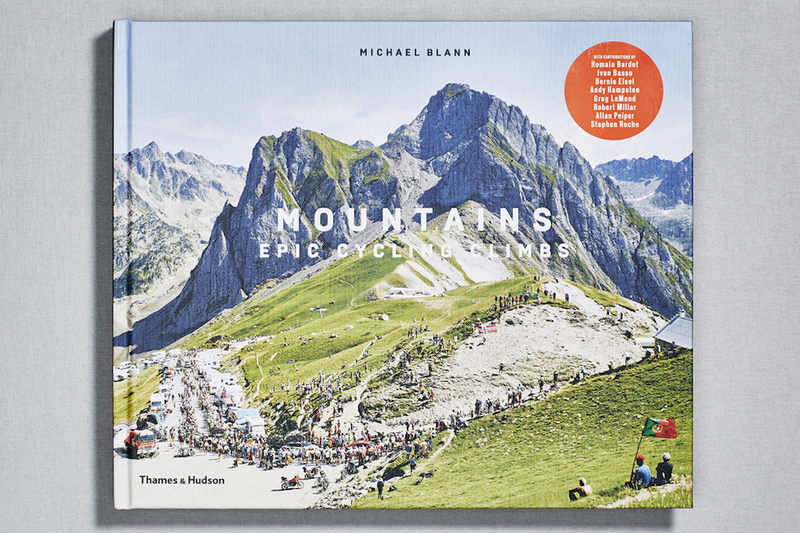 It would make a super gift for any keen urban rider. 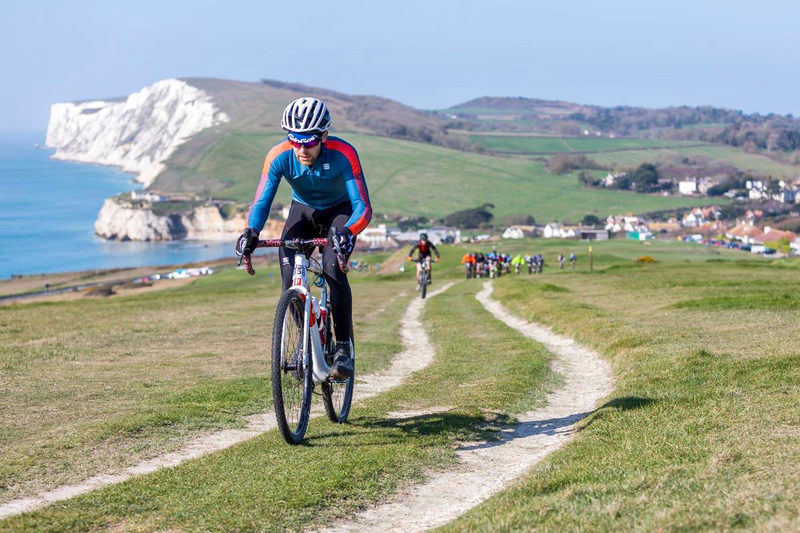 That's all changed with an introduction to the Felvarrom brand, and their sizeable range of products all made of recycled butyl tubes. Everything from trouser clips made from old tubes, to bracelets made from tyres; Felvarrom is all about "up-cycling" materials! I like the ethos behind this kit a lot, but it also looks and works really well. This belt has gained a lot of attention when I've worn it. 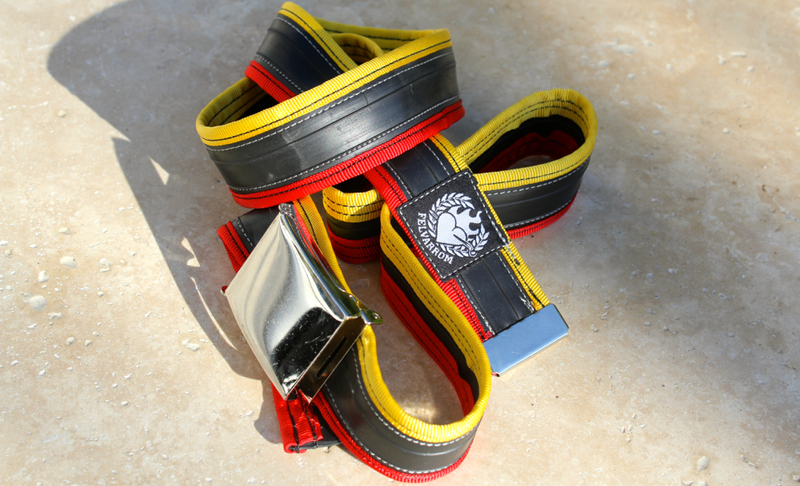 The centre part of the belt is made of a folded inner tube, then the edges are protected/decorated with colour webbing strips. 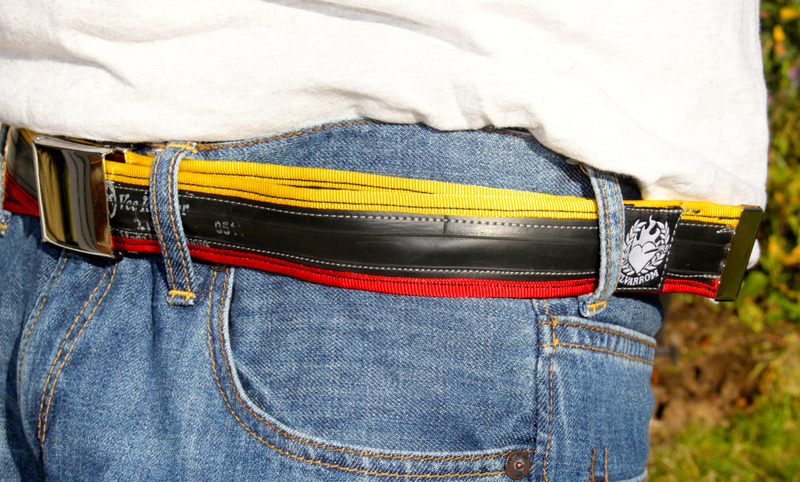 All neatly stitched into place, and finished with a "skater belt" style snap-close buckle. You can see it's an inner tube, I rather like that. 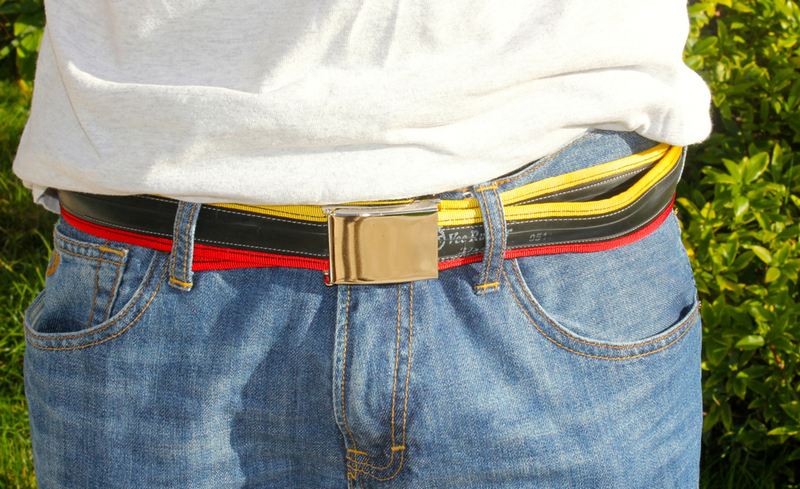 But, at the same time it is a fully functioning belt and works well with any pair of jeans. 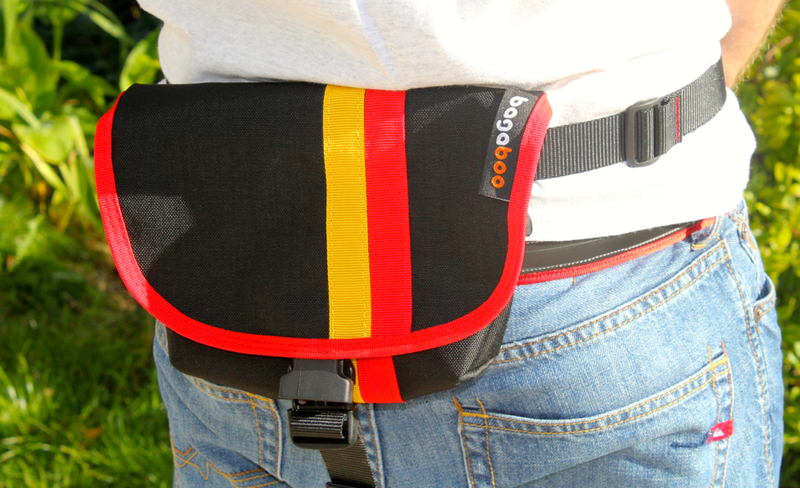 Good for adding a touch of colour too, and of course it is colour co-ordinated with the Bagaboo Hunch Hip Pouch. Both the Felvarrom Belt and the Hunch Hip Pouch are great products. They've got urban class and they are made to such a level of durability that they'll last a long while too. 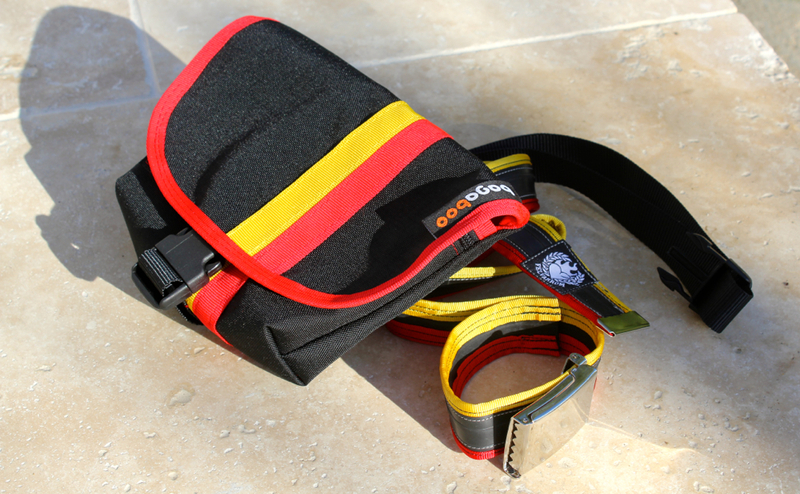 The combination set from Bagaboo would make a really cool present for any rider, and they'll be useful as well.